Each week the Design Team over in the Global Design Project set a challenge. It can be anything from CASE the designer, to sketch, or layout. This week we have a colour challenge. I love playing along with the colour challenge as it really makes me think outside the box, putting colours together that maybe I wouldn't ordinarily do. 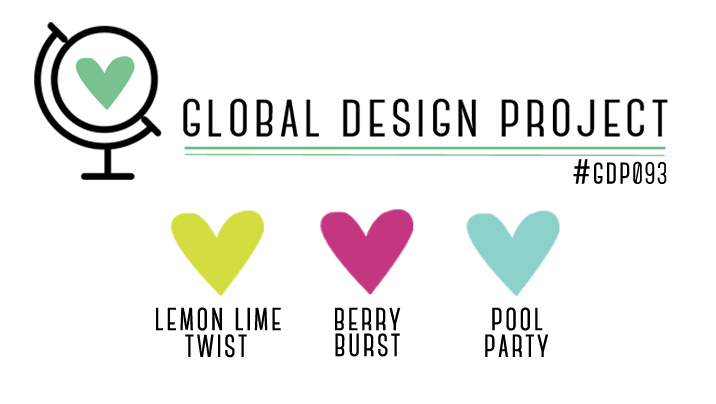 This week we have Lemon Lime Twist, Berry Burst and Pool Party. I love all three of these colours and thought they would work well together. I made a conscious decision not to look at the other entries before I got creating as I didn't want to be influenced by the other lovely designs I would see. 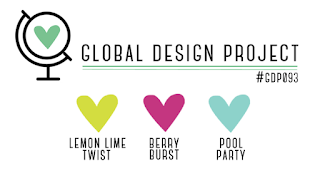 I had a few choices, I could use mainly Pool Party with some Lemon Lime Twist and an accent of Berry Burst or vice versa to balance the strong colours or I could go all out colour. So, I decided to go out of my comfort zone with a little Andy Warholesque (sorry I know its not a word 😁) creativity! I had great fun with this. I used the large cup stamp and the cream or froth to make my milk shakes. I added the straws and the dome lids I stamped on window sheet and cut out. I used the COOL and Happiest Birthday from the Cool Treats Stamp set. The cups are raised on Dimensionals and I have adhered my dome lids using a little snail along the stamped edge at the bottom. Thank you Card using Coffee Cafe with video tutorial. We had a lot of fun on Monday morning at Coffee and Cards with the Coffee Café Stamps from Stampin up. I thought this set was so apt. We have a lovely group of ladies who come to Coffee and Cards and the Coffee they serve there is very good! We as usual had a lot of creativity going on, lots of laughter and chatter. Its such a good way to start the week. The base is A4 card, cut in half at 14.8cms and scored at 10.5 cm. The layer and Whisper White inside is just half a cm smaller at 14.3 x 10 cms. I love this Stamp set. Its perfect for me, I'm not human until I have had my first coffee of the day and to me there is nothing nicer than a good coffee out with a friend. The sentiment "Thanks a Latte" is a great pun and makes a great Thank you card for lots of occasions. These are going to be my customer Thank you cards for June.😊 So if you are one of the lovely people who placed an order with me in June, expect to receive one of these hand made cards in the mail soon.😄 Just a little Thank You for supporting my business. I really do value all my customers and class attendees for without them I wouldn't be here. If you live locally to me do consider coming to Coffee and Cards. We would love to have you! No experience needed and all materials are supplied. It costs just £5 which covers the cost of your materials and also a hot drink of your choice! They also do fabulous cakes too. We run on Monday Mornings 10 - 12 at More + Community Coffee Shop on Parton Rd. Aylesbury. HP201NG. No need to book. Just drop in. Quick and Easy End of Term Teacher Gifts! Its getting near to the end of term and the school year. Our children have around four weeks left before they break up for the summer holidays. Hooray!! It is about this time that I start thinking about teacher gifts. I have three children, two older and one ten year old so I have been doing this for a few years now. I always try to find something that will show my appreciation but of course not cost a small fortune. There is however only so many candles , hand creams, chocolates and bubble baths you need and I am sure it must get a bit 'same old' for them. I wanted something quick and easy but also something useful. I love these new stamps and papers from Stampin Up! I run on coffee so they are perfect for me 😉 I had an idea to make a gift card envelope with them to hold a gift card form a nice coffee shop so that after the stresses of dealing with our little angels the teacher could enjoy a nice coffee out. So simple to do! You could also replace the gift card with a little coffee sachet and biscuits or chocolate to make it even more cost effective if you like. I hope you like the video. Do give me a thumbs up and subscribe for more if you do I'd love to hear your comments. It was a beautiful day on Saturday and the perfect day to get away from it all and spend the day crafting. This is precisely what we did. I held my first Craft Retreat Day and I am so happy to say that everyone has told me they had a lovely time! The calm before everyone arrives. Everyone had a prepared kit full of the supplies they needed for the day to make 20 cards. Five designs to make four of each and also a gift bag. With lots left over to take home and play with too. I had prepared all the card bases and layers in advance leaving more time for creativity. I emphasise that the aim of the day though is fun and relaxation! So make as many of the cards as you like and take home the kit to be able to complete at home as wished. No pressure, just fun! These at four of the five card designs we made using all new products from the new Annual Stampin Up range. Alas my other card sample has disappeared! Though if it turns up I will add it on the blog. Our gift bag using the new Foil Frenzy 12 x 12 papers. (Though it is card stock weight). Perfect for this very simple to make bag and I used the new gold Library clips to secure the top. So much creativity from everyone! Cake for elevenses of course and being the lovely crowd we are we also sang Happy Birthday to Caroline who celebrated the day before. We had delicious warmed scones, clotted cream and also strawberries and cream for our Crafternoon tea. Although I didn't get a photograph before we tucked in! Some samples I received as swaps at a tea training event the previous weekend. Its always great to get lots of ideas! We all had such a lovely time and it was great to be able to spend time with everyone crafting. Lots of cards and gift bags were made. I have to say a great big THANKYOU to everyone who came as they are such a lovely group of ladies and made it a success. I loved it so much I have already planned the next one ! See the details and how to book in the side bar. I'd love to have you! Suitable for all abilities including new stampers. Its been a fabulous week! Last Friday I had my Open House, Catalogue Launch Party - so much fun. I got to craft with all the lovely ladies who came. I served Prosecco and cake which went down well. The perfect accompaniment to a little paper crafting! Do you like the little note books I have covered in the picture above? I have used the Crafting Forever Stamp set for the images and Timeless Textures for the paint splatter. Great sentiments in this set. I like "Crafting Forever, Housework Whenever! "😃 but I thought "Do Something Creative Everyday" was the right sentiment for the notebook. Here's how I made it . I hope you like the video . Its the first of a series of Five Minute Friday tutorials. A bit of fun and a challenge to see if I can actually complete it in five minutes - you'll have to watch to find out! and also to show that there are lots of quick and easy projects out there that can give us our crafting satisfaction without taking loads of time to do. I have made 53 of them. Yes. 53! I am away this weekend at a team craft event. Its a whole weekend of fun, crafting, cake, socialising and more crafting. I got to see lots of the wider team at convention in Amsterdam in April and I will be seeing some of those and also catching up with some who couldn't make it all the way there and I cant wait! So these notebooks are for my swaps. When us demonstrators gather together we make a project, replicate it however many times and swap them at events. We then come home with a bag full of lovely things, ideas and inspiration! My first order has gone in and I am patiently waiting for my delivery!! I have a few favourites already. The Planner! It really is so beautiful . It is a kit full of pages, stickers, page dividers, photo pockets and it is suitable for everyone. The dates are blank so you can start at any time of the year and yo can also buy refill kits! So excellent value for money too. Its on my order! Colour Theory Suite. Memories And More. A couple of the gorgeous new ribbons. I already have the Piggies! I won this Stamp set at convention. This little piggy. Its so cute and I've used it a few times already. My ladies at Coffee and Cards loved it too. If you look on Pinterest there are lots of fabulous projects made already with this cute set. I have the Colour Theory Stamps, dies and papers already and they are just brilliant. Look out for a blog post coming soon showing how this range is perfect for memory keeping. I have a few of the brand new ribbons too. They really are beautiful. I will be offering a ribbon share in July, so watch out for that. It means that if you don't want to buy whole reels you can sample lots of the ribbons at a fraction of the cost of buying whole reels so you can try more! This catalogue is full of beautiful new things. I will share more with you as soon as my delivery arrives. Have a great weekend. I hope you get to do some crafting too! This Little Piggy! - from the new Annual Stampin Up Catalogue. Out today!! So excited for today! 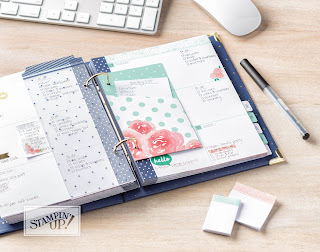 The new Annual Stampin Up Catalogue is launched today!!. As demonstrators we have been able to pre order for quite a while but a selection of items. Some of them have been popping up all over Pinterest and You Tube already but I cannot wait to see what amazing things are going to be created now the whole catalogue is released. I love it. I really think its the best one we have had. SO many lovely things inside, it full to bursting! Whilst at Stampin Up Convention in Amsterdam in April I was very lucky to win a cute new stamp set during Prize Patrol. It is so fun. So of course I had to have a play with it. I used the Piggy image as my main focus and some of the beautiful new Delightful Daisy DSP (patterned papers) behind. I added some little daisies I had stamped from the new Daisy Delight stamp set. This required a little fussy cutting but really hardly any The card base is Powder Pink. Its a beautiful soft pink and one of the 5 brand new 2017 -2019 In colours. I hope you like him. I will be using him/her a lot I am sure. Please leave me comment to let me know what you think. Our beautiful new 2017 - 2019 In Colours! In addition to the main Stampin Up Colour families, each year 5 new In Colours are released. These are our new ones. Aren't they lovely. Which is your favourite? They have great names too. Tranquil Tide, Berry Burst, Fresh Fig, Lemon Lime Twist and Powder Pink. Stampin Up's match all their colours throughout their inks, card stocks, marker, patterned papers ribbons and embellishments. Making it so easy and takes the guess work out of everything. If you place an on line order for between £20 and £150 please add hostess code YUWHS2PW on checking out and I will send you a little thank you gift at the end of the month. If your order is £150 or more there is no need to add the code as you will earn your own Stampin Rewards! If there is anything you would like help with, don't hesitate to ask. I would love to earn your custom. If you have a big wish list and want to save money or would like to get your hands on all the new Stampin Up products at a great discount! join an amazing paper crafting family, have access to training and of course a great discount then get in touch for a chat. Id love to have you in my team!